It’s Friday: time for another “One Simple Change” post! If you are new to my One Simple Change series, here’s the deal: every Friday in 2012, I am blogging about healthy lifestyle tips gleaned from my years studying and practicing naturopathic medicine. As much as I love sharing recipes, I enjoy sharing other information related to health and wellness, too; these posts are a way for me to do just that. Today I’ve got a follow up to last week’s discussion of fats and oils. I received a bunch of questions about which fats and oils to use when, so I felt it made sense to spend more time on this topic. 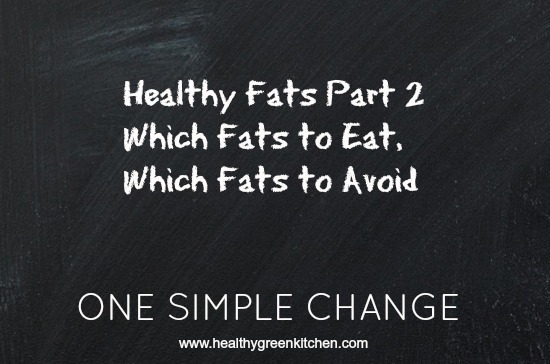 If you read part 1 last week, you know that I am all for the use of natural fats and oils (aka traditional fats and oils), and that I don’t recommend using the more processed, newer, “man-made” fats and oils that are touted as healthy (ie margarine, shortening, and certain vegetable oils), but which in reality, are not. The information here is based on my own research and experiences cooking and eating this way for many years now…I hope this post helps to clear up any confusion you have about how to use healthy fats and oils in your kitchen, but if not, shoot me your questions and I’ll do my best to answer them! Let’s start with general cooking: i.e. sautéing, stir-frying, roasting, etc…techniques where you are using heat that ranges from low to high (but not as high as deep frying). The best fats and oils for these purposes are going to be those that are saturated and monounsaturated, as these are the most stable (ie they have a pretty high smoke point) when heated to moderately high temperatures: butter, organic coconut oil, and olive oil. When I was growing up, I always felt bad about eating butter. And coconut oil? I wouldn’t have touched it with a ten foot pole. You’ll still find many sources that say you shouldn’t eat these fats because they’re saturated, but there is also a ton of recent evidence that says not only are these fats not harmful, they are actually health promoting. I use butter and organic coconut oil all the time in my kitchen. Last week I told you that it’s best to use organic butter and I stand by this statement, and if you can get not just organic, but grass-fed butter, you are extremely lucky indeed…it’s full of vitamins and a special fat-burning nutrient called CLA (conjugated linoleic acid). But if you can’t get grass-fed butter or you just can’t justify spending the money on organic butter, then it’s still better to use regular butter than it is to use butter substitutes and some of the vegetable oils. Organic butter to me is like a treasure- it’s expensive, yes, but that just makes me savor it all the more. It’s really the best fat for baking, and the flavor is incomparable. As for organic coconut oil, I just adore it: I use it in dishes with an Asian flavor profile (stir-fries, Asian soups and stews, etc), and I like experimenting with it in baked goods, too. It’s also great for cooking eggs. The only potential issue is that it does have a somewhat pronounced coconut flavor which not everyone loves (my husband, for example, is not a fan). 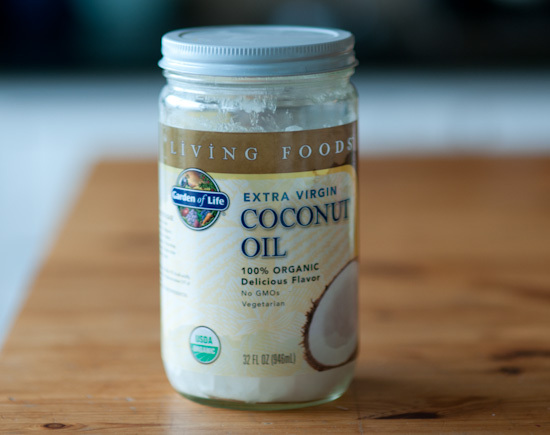 That said, if you enjoy the taste but are still wary about using butter and/or coconut oil, know that these are said to be the best fats to ingest if you have blood sugar issues (even better than olive oil); organic coconut oil also has a reputation as being useful for weight loss: this one is my favorite . Unlike some of the other traditional fats and oils, olive oil has always a good reputation health-wise. It isn’t saturated; it’s a monounsaturated fat. While many people think that olive oil is not suited to high heat cooking, olive oil has long been used for every type of cooking in countries like Spain. This makes sense because olive oil has a high smoke point. I personally use olive oil a ton in my kitchen. I cook with it daily, bake with it on occasion, and use it just about every time I make salad dressing. I am happy to see that Diana of A Little Bit of Spain in Iowa wrote a post and made a video about the right way to cook with extra virgin olive oil. Note that to preserve the healthful properties of olive oil, it’s very important to bring it up to higher temperatures slowly (if the oil starts to smoke, it’s too hot), and that it’s not appropriate for deep frying. Now let’s talk about animal fats like lard, duck fat, and tallow (rendered beef fat). These are quite suitable for cooking and baking, and in some circles (among those who eat “paleo”, for example), these fats are actually preferred to butter and olive oil for general cooking, especially high heat cooking. This article by Pete Wells for Food and Wine entitled Lard: The New Health Food sums up cooking with lard quite nicely; it’s really time people let go of the fear of cooking with this useful fat. I am not talking about the highly refined lard, etc. you can find in a typical grocery store, though. I am talking about lard rendered from the fat of grass-fed pigs, and the other animal fats need to come from pastured animals in order for them to be healthy, too. Always remember that when eating animal fats (and all animal foods in general), the environment in which the animal was raised has everything to do with whether or not the fat or meat of that animal will be good for you. The fats (and meat) of pastured/grass-fed animals have a completely different nutritional profile than the fats (and meat) of animals raised on a feedlot. If you want to eat animal fats (and meat) that are healthy, you need to buy them from a local farm or a butcher that sells grass fed animal products. I personally don’t use animal fats in my kitchen all that much, but pie crust made with pastured lard is fantastic, as are potatoes roasted in duck fat. I don’t have any experience with tallow. I will say that I was previously using grapeseed oil for frying (which I only do on occasion for latkes and a few other foods), but in researching this piece, I’ve decided not to use grapeseed oil at all anymore (because it’s rich in vitamin E which really shouldn’t be heated; it also likely contains GMOs); from now on, whenever I do fry something, I am going to use pastured lard. What about cooking with peanut and sesame oils? My feeling is that these are fine, though peanut oil is high in omega 6 fatty acids, and most people already consume too much of these. Sesame oil is better drizzled onto foods then it is as a cooking oil because it’s pretty fragile, and what you’re really after is its wonderful intense taste, which gets lost when you cook with it. Macadamia, pumpkin seed, and rice bran oil are other examples of oils that are fine for cooking at moderate temperatures; avocado is yet another, and I was surprised to learn it has a very high smoke point. Make sure that any oils you buy are cold pressed and unrefined, and don’t contain GMOs. I often see recommendations that it’s healthy to cook over high temperatures with canola, cottonseed, soy, sunflower, and safflower oils. I don’t agree with this at all because all of these cheap oils are generally refined, bleached, and deodorized. I don’t know about you, but I don’t want to put stuff like that into my body. “Vegetable oil” is generally a mixture of refined oils- and is best avoided, too (note that unsaturated oils like canola oil are actually quite fragile, and really aren’t suited for high temperature cooking because they are prone to oxidative damage at high heat…I don’t recommend using canola oil at all in the kitchen, but if you really want to use it, only use it uncooked; if you do cook with it, don’t use it over moderate heat). Unlike the refined, mass-produced, cheap oils mentioned above, flaxseed oil, as well as almond oil, walnut oil and other oils from nuts and seeds you would eat, are quite healthful, and are perfect for using cold: these are best in salad dressings and drizzled over cooked dishes. These oils are quite fragile, so should not be heated, and should be purchased and used when they’re as fresh as possible. Flaxseed oil, in particular, must be kept refrigerated and should be used up within a month or so because it goes rancid quickly. A good quality flax oil will always have the bottling date and the “best before” date printed on the label. As for flax seeds- I think these are best ground fresh, and used raw. Though I have added them to baked goods on occasion, I don’t think this is ideal. One last note: don’t forget that along with figuring out the best ways to use healthy fats and oils in your kitchen comes the need to be aware of what fats and oils are in prepared foods you buy, as well as food you eat when you’re not at home. Read labels of all packaged foods and be sure to avoid anything with partially hydrogenated oils and/or trans-fats, and know that when you eat in a restaurant, the fats and oils used might be questionable (depending on where you eat). Did I leave anything out? Please let me know if you still have questions. Is having this information helpful for you? Will it change the way you cook and eat? Are you “in” to this weekend One Small Change? You are so right- thanks for pointing this out. I always buy organic olive oil. Hello Winnie – this information is so valuable. We have such a perception of these healthy fats as not being healthy when in fact as you have pointed out, they are! Well said and thank you. You are welcome. Thank you for your comment. Winnie, this is great! I learned some good info and am posting the link to my Facebook page. I do have a question – what are your recommendations about when to use olive oil versus extra virgin olive oil? Valuable info that I have saved to review again and again. Thanks – quite an education, Winnie! Thanks for all of the great information! I especially like the tutorial you linked to on heating olive oil slowly. I know I’ve watched my olive oil smoke and been very unhappy about it. What do you think about grapeseed oil? I’ve been cooking with it because I thought it had a high smoke point, but maybe it’s fragile like sesame oil? fragile. Thanks! I do mention above that my research turned up some problems with it. Probably not the best if using it often. This is very timely for me as I’ve recently been struggling with what oil to use. I always used olive oil for everything then read that it wasn’t suitable for high temperatures. Rapeseed oil is quite popular at the moment in the UK as the latest “healthy” oil but I think it may be canola with a different name, have you heard of it? Thanks for all this information, so helpful! Yes it is indeed canola. I’d avoid it Jayne. But I do like the pun! Thanks for the mention Winnie, I really appreciate it. I’m going to have to share these posts, they’re excellent! Thanks for sharing your expertise. Thanks Diana- I love your perspective, as well. Thanks for this info Melanie! Yes, I’d grind the seeds yourself (a small coffee grinder does the trick) and sprinkle them on oatmeal, salads, etc. I just started using coconut oil in the past couple of months. I try not to use any other oils besides olive oil, but as you demonstrate, there are some other healthy options out there. Also, I should tell you that I am now drinking a glass of water every morning when I wake up. You are brilliant. So happy to hear about the water, Brian…and thanks for your support. I am wondering what you think about alternative “butter” spreads such as smart balance / earth balance. Thanks. I don’t really trust them- they seem pretty processed to me. So glad to read this post! I’m still trying to convince many people in my life that they should get rid of all those so called “healthy” vegetable oils and start eating butter and coconut oil again! Winnie – what do you suggest I use as a healthy substitute for canola oil? For years, I’ve used canola oil in many muffin and cake recipes . I have used mild olive oil once in a while, but hope you can point me in the right direction. Thank you! I use butter or coconut oil for baking Katrina. the world of olive oil can be confusing. Organic is not a guarantee for quality–just certain standards for what is sprayed on the trees and used as fertilizer. Really high quality olive oil is by definition organic–grass is allowed to grow around the trees and is cut for natural fertilizer, and to produce a good quality olive oil the trees need to be at a certain latitude and longitude–above sea level, on hill tops that get plenty of breeze so that fog doesn’t have a chance to settle and moisture is whisked away–a natural preventative for pests and molds. Trees have to be pruned properly, olives must be stored in ventilated crates, pressed within 24 to 48 hours–just some of what the farmer is faced with to shoot for the top. I’m so happy your writing this weekly posts. I have a question : What’s your opinion about Earth balance vegan butter? Since I found out I have high cholesterol I’m using it instead of butter and would like to know what are your thoughts. Thank you for those great “one simple change” posts! I just wanted to mention cocoa butter. I like cooking with organic raw cocoa butter. You can cook with it at a high temperature and it’s great for baking. I rarely hear about people cooking with it and so I was wondering what you think about that fat option? I’ve been using Napa Valley Naturals EV Organic Olive Oil. Highly recommend! They ship free on orders over $49. The oils are not refined. I read on one bottle “lightly filtered”. As a bonus, they are really reasonably priced in my opinion. A 25 oz. bottle of EV organic olive oil is 11.99. I’m not affiliated with this company in any way, just a satisfied customer. i recently found cold-pressed extra virgin rapeseed (canola) oil at waitrose being advertised as more suitable for baking and stir-frying than extra virgin olive oil (which is what I normally use). I was quite tempted to buy it but I wasn’t sure if it was a good choice or not. It is organic and stored in a dark bottle, and really looked like quality oil to me (it even won an award at Taste 2011!). I read different opinion on cooking with extra virgin olive oil. Some say that it has a low smoke point, and that it is better to use quality rapeseed oil for such preparations. What do you think? Also, what about ghee? Any suggestions about cooking with it? It should be from grass-fed animals, too, I assume.